Step 1: open the application and take a look at the bottom toolbar. On the right hand side, you’ll find the Apps option. Simply tap the corresponding icon. Step 2: you’ll be shown a list with all the applications installed on your device and that are ready to receive an updated. Scroll through the list to see all the apps and decide which ones you want to update to the latest version available. You can do so by clicking on the round arrow-shaped button to the right of each app. Step 3: you can also choose to update them all at once with the Update All option that you can find on the upper right hand side of the interface. Just click on this button to launch the process. To carry out the update, we advise you to be connected to a WiFi network and to establish from the app’s settings that updates should only be completed when connected to a wireless hotspot in order to save data. In turn, in this settings menu you’ll also find the Updates option. There you can choose whether to be shown also beta versions of the apps and system apps. To access the configuration, click on the human-shaped button on the upper right hand side of the interface and then click on Settings. 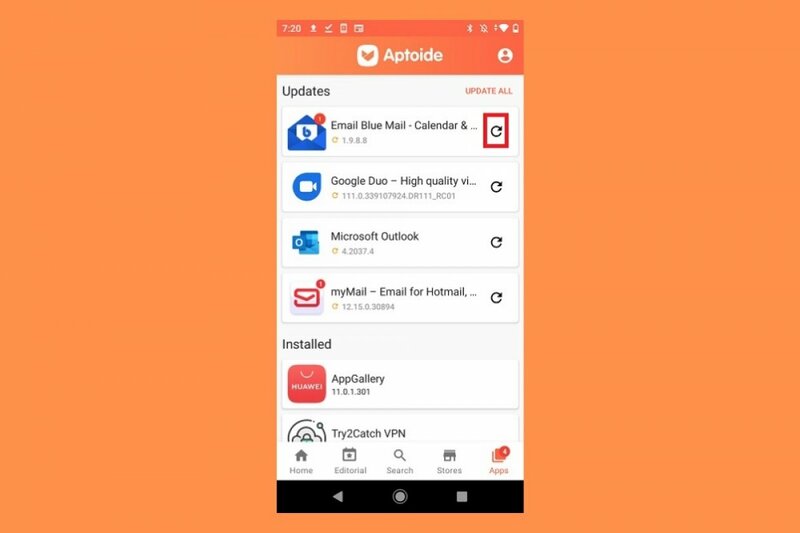 The Aptoide update system prevents the user from having to manually search for new versions of applications as also happens on Google Play.